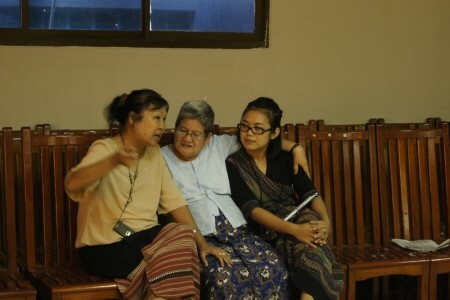 Three women engaged in peacebuilding in Myanmar, here during a training session on peace negotiations by swisspeace and the Shalom Foundation in Yangon, Myanmar, in October 2012. Photo: Rachel Gasser. When we think of efforts to bring peace to Myanmar, the main picture most of us have in mind is that of Aung San Suu Kyi. Even if today she is still an essential element of the Myanmar transition, the road to peace and democracy is paved by many other female characters whose faces are less familiar to us. As in many other contexts around the world, it is mainly men who sit on both sides of Myanmar’s negotiating table. However, the recent dialogue between the government and the Karen National Union (KNU) was an exception in that it was the first time talks were headed by a woman: Naw Zaporah Sein, the current Vice-Chairman of the KNU. In addition to the head of the delegation, several members of the KNU peace negotiation team are also women, among them an influential legal expert. Additionally, several women sit in the negotiation room as observers and provide feedback to both sides after negotiations. In Mon State, the Mon Women Organisation (MWO) has been a key network to advance human rights and development in the region. It currently supports Mi Sa Dar, a member of the Central Committee of the New Mon State Party (NMSP) who participate in the peace talks with the government. Despite the challenging environment that peace negotiations often present, Mi Sa Dar has managed to bring female voices to the negotiations between the Myanmar government and the NMSP. Myanmar civil society has been vibrant for many years and has worked creatively even under very difficult conditions. With the recent opening of the country, civil society actors are gaining more space and are now conducting a wider range of activities. In the field of peacebuilding, for example, the Shalom (Nyein) Foundation (SF) has been pivotal for more than ten years. Ja Nan Lahtaw, SF Assistant Director, and Nang Raw Zakhung, SF Program Manager, support several peace processes around the country by bringing expertise to negotiations and creating platforms for dialogue. To ensure public participation in peace processes, they also organise public consultations in remote villages. Nilar Thein is part of the 88 Generation Students movement and was imprisoned several times in her life. The last time she was imprisoned was in 2008, following the 2007 protests where she organized a march of roughly 500 people to protest against government policies. Just after her release in 2012 at an event in Yangon, Nilar Thein told participants how fantastic it was to learn again and exchange freely among people who want to advance democracy in Myanmar. She added that she felt so lucky being able to participate in building a better country for her daughter, whom she did not see for many years while she was in prison. She showed no desire for revenge or even sadness about the past, only to look to the future and shape the present. Myanmar’s female parliamentarians are also making a telling contribution to Myanmar’s peace processes. Daw Doi Phu, for example, became the first woman to join the government negotiation team headed by U Aung Min. She participated in talks between the Kachin Independent Organisation (KIO) and the government which took place in May 2013. Several women also attended the meeting as observers and both sides expressed their commitment to continue having women in the negotiating room. More or less visible, more or less supported, more or less at risk, hundreds of other women are also investing their time, energy, knowledge and commitment to building the future of Myanmar today. Along with some outstanding men, they are the new faces of Myanmar, which deserve far more attention than they currently receive. Rachel Gasser is Program Officer, Mediation at Swisspeace.